We were fortunate to start FreeAgent at a point in time when things had just taken a turn for the better for web developers. Prior to 2005, I was writing web apps in Java using technologies such as Spring, Velocity and (sorry for swearing) Struts. Then along came Ruby on Rails. Rails was perfect for our bootstrapped startup. Its conventions allowed us to focus on rapidly developing the core functionality and front-end UX of our app (yes, with hindsight at the cost of ignoring ‘purer’ OOD approaches… but that’s another story) without worrying about configuration. Writing Ruby made me happy. The Ruby/Rails community encouraged us to write TDD. I was productive. We shipped a complex web app in less than a year. But as any seasoned Rails developer will tell you, it’s not all sweetness and light. Especially when it comes to upgrading Rails. 2007-03-16: Updated vendor/rails to r6419 (Rails release 1.2.3). Locked vendor/rails. 2009-07-24: Used 'rake rails:freeze:edge RELEASE=2.3.3" to vendor Rails 2.3.3. We started back in 2006/early 2007 on Rails 1.1, quickly moving onto 1.2 then going through a major upgrade pretty much every year since (clearly we’ve also improved our git workflow, branch naming and commit messages over the years). As you can see from the final commit we have finally moved through to Rails 3.2, the latest stable version. There are many reasons why you want to keep up with framework releases, especially in the Rails world: security, compatibility (namely Gems), functionality (e.g. asset pipeline), team morale (new! shiny!! ), performance. Some frameworks maintain full backwards-compatibility, whilst Rails sacrifices this to stay lean(ish) and opinionated. Over the long term this is a good thing but it can make upgrading really painful. Especially as your code base grows as much as ours has. For the last two years we’ve been running on Rails 3.0 which itself was a pretty major undertaking, especially when you’re crazy enough to combine it with a move from Ruby 1.8.7 to Ruby 1.9.2 like we did. However in the last few months there have been a spate of Rails security patches which resulted in 3.0. x being excluded from future patches. issue is judged by the core team. We take security seriously so this made us to bite the bullet and take the time to upgrade to Rails 3.2. The above git history clearly shows that we did go live with Rails 3.1 back in June 2012 but we saw such bad performance degradation that we pulled it after an hour and never returned. We didn’t want to go through this again. Passing a template handler in the template name is deprecated. render :handlers => [:erb] instead. In addition to this, we created a new rails-3.2 branch on which we applied changes that couldn’t be backported. We kept this in sync with master (the mainline branch we deploy from) on a daily basis. This took about three weeks to work on and get into a QA-able state. From there on in were we pretty much home and dry. out of Rails 3.2 using a canary server. 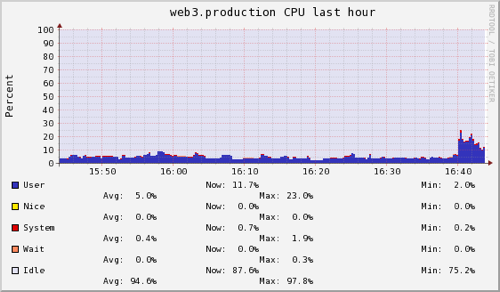 This seemed a sensible idea, temporarily shifting a percentage (in our case 25%) of traffic to an upgraded web server and watching the graphs. What we didn’t expect was a bombardment of 500 errors from the Rails 3.2 server! Fortunately we had a solid rollback plan which meant within a matter of seconds we had removed the canary server from the load balancer pool and started to dig into the error logs. So what was going on? As it turns out in Rails 3.0 the FlashHash class was derived from Hash. In Rails 3.1 and beyond FlashHash is not derived from Hash! Because the flash is marshalled, sessions containing a flash that have been generated on a Rails 3.0 server will cause the world to end when read from a 3.2 server and vice versa. Thanks Rails. Like I said, upgrades can be really painful! There are possible hacky workarounds but this was just too risky. Instead we dropped the canary plan and decided to change the session key in our 3.2 branch and roll it out to everyone when app traffic was low. The only downside here is that everyone would be logged out of their session upon deploy. All things considered, this was a small price to pay for a safe release. # memcache stats. Disabling for now. This brought the hit rate back up to 90%+. Party time! Although the dust is only just settling on this upgrade, we were pretty late to the Rails 3.2 party. The Rails 4 release is just around the corner and Ruby 2.0 is already in the wild (and Basecamp is already running on both), so we plan to start experimenting with this combination really soon. And we wouldn’t want that, aye?